What’s as much fun as inventing your own pizza? Entering the original recipe in this crazy contest and winning a pizza party and lots more! We created this contest to celebrate the launch of Tony and the Pizza Champions (Chronicle Books 2009) by World Pizza Champ Tony Gemignani. Through June 12 olive pizza lovers nationwide can submit their best, original pizza pie recipe in this delicious contest to win exciting prizes. Inventive pizza makers, ages 10 and older, can enter their yummy, olive laden pie and a photo at www.lindsayolives.com/pizza for a chance to win a $250 pizza party and more. Taste: is it truly yummy? Originality: is it something he’s never seen before? A fresh twist on the traditional? Visual appeal: is it mouth-watering? Can he hardly wait to take a bite? How well Lindsay Olives are used in the recipe: colorful, playful, stuffed or sliced! 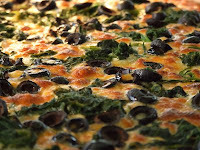 Eleven runners-up will win an autographed copy of ‘Tony and the Pizza Champions,’ and these winning recipes will also be posted on the Lindsay Olives website. Please visit www.lindsayolives.com/pizza to watch Tony’s dough-tossing acrobatics, for contest details, rules and hints, and for tips for making great olive pizzas. The World Pizza Champions has earned the highest awards in several different categories in the pizza industry. They are considered by many pizza operators worldwide as professionals and pioneers. Team members have appeared on the Today Show, Master of Champions, Emeril Live, Tony Danza Show, The Tonight Show with Jay Leno, , Early Show, CNN, The Ellen Show, ESPN, the Food Network, Good Morning America, BBC Radio, and numerous industry magazine covers. They have come together to form an affiliation to promote their restaurants and their skills. Individually each of them has performed on shows nationwide, but now they tour the world as a team. The World Pizza Champions™ perform and/or compete at numerous festivals, fairs, sporting events, and food shows all year long. Lindsay Olives provides a full line of olives, ranging from the delicious, savory California black ripe olives to more exotic imported varieties, like stuffed Spanish Queens and Greek Kalamatas. For wonderful recipes and serving suggestions please visit www.lindsayolives.com.